Happy Lolla-weekend Chicago! Before all the fun of the weekend festivities of the 4 day concert event, we wanted to share with you all of the Sugar Fix fun we’ve been having all week at the office and out on the town! This week we had an amazing Zoom whitening case. 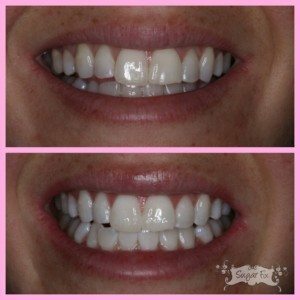 Our patient received amazing results and is going to keep it up with her at home whitening trays. If you want to add a pop to your smile before the end of summer, call or email us to set up a visit, you will love it! Pearly whites in an hour! We love making your smile look great, but it is also important to take care of those back teeth! We were busy transforming old silver fillings into beautiful Cerec porcelain restorations for our patients, 13 in total! These restorations not only look flawless, but are much stronger than traditional amalgam(silver) or composite materials. Our patients loved the technology advances and were very happy with the ease of the procedure. Unlike traditional fillings were bands are placed and maybe there is a good contact to your other teeth, cerec makes it easy to make the restorations in 3-D! The scanning software shows the images of your teeth and then the restoration is made with our “3-D porcelain printer” cerec unit. It truly is amazing technology and takes out any guess work and frustration of traditional fillings and re-do’s. Dr. Emery had a great night out with Dr. Ali this week. They went to Frasca’s right next to Sugar Fix for a dinner to swap stories and discuss some fun dental ideas. What a fun night with two brilliant girl bosses! That’s it for this week, look out for smiles spotted at Lollapalooza 2016 on Instagram and have a great weekend everyone!